Making good on the promise he laid out in the State of the Union address in January 2014, President Obama put pen to paper this week and signed two executive orders: one that prohibits federal contractors from retaliating against employees who share salaries, and one that mandates that federal contractors publish wage data. Essentially he is putting the smack down on gender bias and that pesky wage gap that still exists in America which shows women earning 77c out of every $1 that a man makes. While we need this type of mandate for every employer in the country, this is a phenomenal step forward in the right direction. 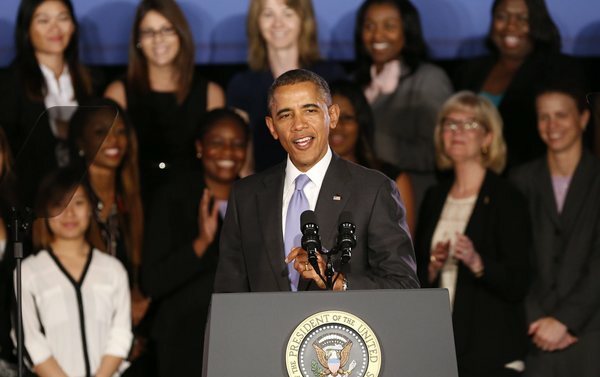 “We are going to work to make sure that our daughters have the same chance to pursue their dreams as our sons,” he added, urging businesses and the government to do more to hire women and achieve gender equality in a bid to lift families out of poverty and allocate more resources to child care, college tuition and retirement savings. “We don’t have second-class citizens in this country,” Obama said. Here are some stats about what women lose out on, and how it affects their household and community when they aren’t paid the same as men for doing the same job. Mr. President has been making a big push to bring change into American Society, and he is taking it seriously. He has started a national campaign meeting with citizens, businesses, and colleges to further state his case about why the wage gap needs to be abolished. “It’s time to do away with workplace policies that belong in a ‘Mad Men’ episode,” he famously said back in January. 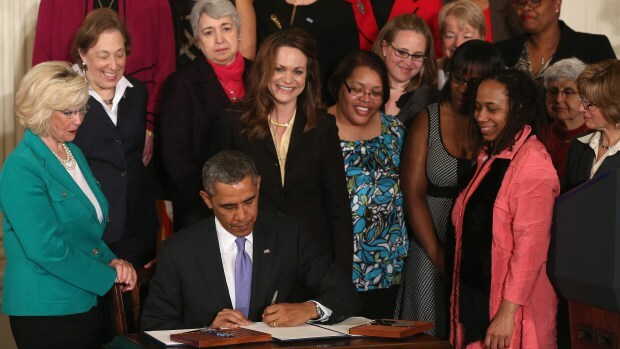 While what Obama is doing is a positive step, Congress this week made a step backward by blocking the Paycheck Fairness Act for the third time in a vote this week, mostly due to Republican Senators. The bill would’ve ensured that ALL employers in America (not just federal contractors) would be held to the same standard as the Equal Pay Act of 1963. It deeply saddens and disappoints us that this is not a priority for some Americans. Since when is equality not important enough? You’d think it would be a no brainer! But we are hoping it will be back, and this is why is it more vital than EVER that our generation step up and get involved in politics to change the ridiculous outdated standards that are still being held as ideal in government. If you are confused about the difference between the Equal Pay Act and the Fair Paycheck Act, check out Marie Claire magazine’s breakdown of the two right here. 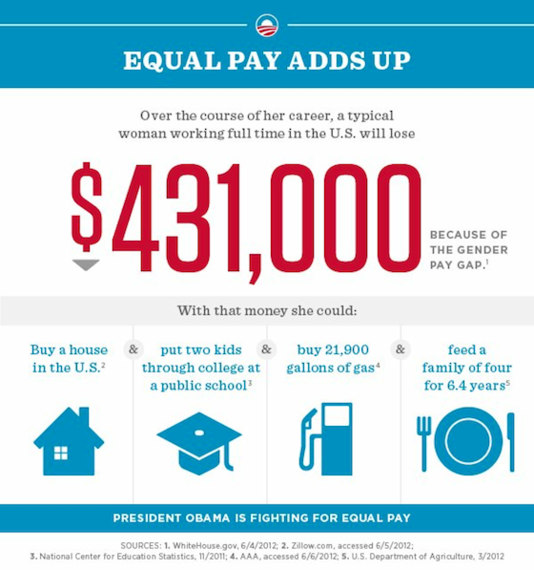 The very first bill President Obama signed when he came into office in 2009 was the Lilly Ledbetter Fair Pay Restoration Act. The Ledbetter Act, named after a nearly retired product supervisor at a Goodyear tire plant in Alabama who took her case of unequal pay to the Supreme Court in 1998, made it easier for women to sue employers for discriminatory wage practices. “It was an anonymous note in [Ledbetter’s] mailbox at work, to let her know that she was paid unfairly. We still don’t know who that person is, and up until [today], this person could be fired for telling her,” said Lisa Maatz, vice president of government relations at the American Association of University Women. While there is still a lot of work to do on the government’s behalf, we as ordinary women and everyday citizens can play out part. Raising our voices and not being afraid to demand what we are worth in the workplace is an important start. We have to realize that while changes in the legislature are coming, we can’t allow any industry to determine what we are worth. It doesn’t just affect our bank accounts, but the rest of our lives. The only way to truly live as empowered women in the 21st century and ensure the next generation can live without gender bias, is to keep demanding change and working hard to see it happen. Wonderful article! Hoorah for Obama. We must all keep working hard to move forward.